Buffy the Vampire Slayer had covered a lot of classic monsters during its seven year run. 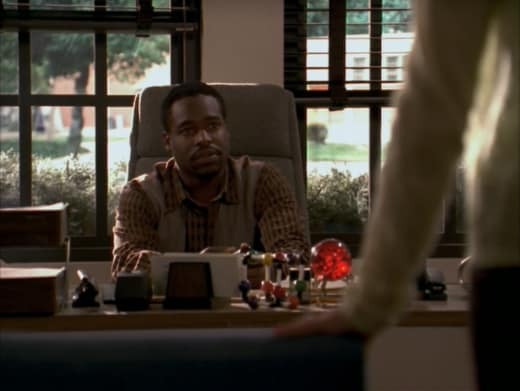 For Buffy the Vampire Slayer Season 3 Episode 4, the Monster of the Week was the appearance of a 'Dr. Jekyll and Mr. Hyde' situation. Unfortunately, this monster should've stayed in the pages. An angry teen with juicing issues was a strange misstep in an otherwise great season like Buffy the Vampire Slayer Season 3. Don't believe me? Join me in rewatching "Beauty and the Beasts" and let's find out why. 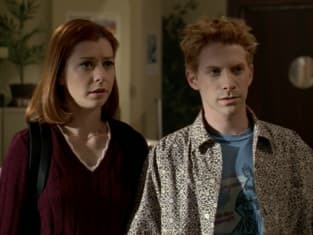 The extent of Willow and Oz's romantic relationship had never been explicitly explained before Buffy the Vampire Slayer Season 3 Episode 4. Light flirting and some kissing were the only actions shown to the audience. And we can't forget that it took them awhile before Oz even took the next step. So, when Willow joked to Xander about a 'half monty' with Oz, it felt pretty scandalous for their relationship. How far had their relationship progressed? She probably caught a few glimpses here and there when he changed back into a human. But, this teasing was a new side to her we hadn't seen before. Willow: I put those towels up for privacy. Xander: Oh, no worries, I can handle the Oz full monty. I mean, not handle handle, like, uh, hands-to-flesh, handle. Willow: Okay, well, it's not for you. It's for me. Um, 'cause I'm still getting used to half a monty. Xander: Oh, good. Half? You and Oz? Which half? Willow: Wouldn't you like to know. When Buffy was chatting about Scott to Faith during their patrol, it became clear their relationship was never meant to be. Maybe it was foreshadowing or the hindsight of rewatching it now, but the pieces were being set up to sever this high school flirtation. Buffy was so hesitant to even get comfortable with Scott, that we couldn't connect with him ourselves. Faith, on the other hand, was being typical Faith. The possibility of carnal fun outweighed any thought of a relationship; she only looked at men like a plaything. Seeing their dichotomy over their positions helped to show how different both slayers viewed their dating lives, as well as their outlook on life. "Beauty and the Beasts" was the second time that showed how different Buffy and Faith were from each other. And that's not just because it was the second episode that Faith appeared. Faith: All men are beasts, B.
Buffy: Okay, I was hoping to not get that cynical till I was at least 40. Faith: It's not cynical, I mean, it's realistic. Every guy, from Manimal right down to Mr. I-Loved-The-English-Patient, has beast in him. And I don't care how sensitive they act; they're all still just in it for the chase. Permalink: All men are beasts, B. Solely as characters, did anyone care for Debbie and Pete? Both of these characters could simply go away and I couldn't care less. Sure, they were Scott's friends and we were introduced to them for the purpose of Buffy the Vampire Slayer Season 3 Episode 4. However, since they were new, we knew nothing about their relationship or their past with Scott/Sunnydale High. Why should we be invested in either of them now? If they had utilized someone we already knew from Sunnydale High, the plot would've pushed the connection even further. From the on-set, they were a happy couple who secretly had a dark problem between them. They served the plot and that's it. The same goes for Mr. Platt. We never knew about him before, but the little bit of backstory we were presented with was to give a connection to these students that we had never seen before. His introduction was rushed for the sake of time. On the other hand, where Mr. Platt succeeded and Debbie/Pete failed was that he left a mark on Buffy. Buffy: Not too crazy? Those are your credentials? Mr. Platt: Look, Buffy, any person, grownup, shrink, Pope, any person who claims to be totally sane is either lying or not very bright. I mean, everyone has problems. Everybody has demons, right? Buffy: Gotta say I'm with you on that. Mr. Platt: Excellent. So, the hope I bring you is...demons can be fought, people can change. You can change. Permalink: Everybody has demons, right? In his short time during "Beauty and the Beasts," he got Buffy to open up and share more than she ever had before. He truly cared about Buffy and wanted to help her through her issues. Mr. Platt had all the potential to be a good ongoing character. Plus, his blunt and direct attitude could've been wonders for a lot of the characters. Imagine what he could do with Xander in the room? He might've been able to fix the character and all his misogny. Mr. Platt would've had no time for any of that idiocy. It's a shame that he got murdered by the demonic angry Pete! The debate over Oz's transformation and the murder could've been answered with simple logic. Like, the series of events that would've led to him killing the Sunnydale High student were a stretch. The Scoobies should've known better than to doubt him. Think about it: Oz, as a werewolf, was trapped in the locked cage in the library. Even if he climbed through the window to hunt down the student, why (or even how) would the werewolf come all the back to the library, climb the window and return to the cage? Returning to his original location would've required a lot of planning and clear thought. We've seen in the past that the werewolf is a feral creature that doesn't think. Plus, the window would've been broken if the werewolf climbed through it. Cordelia, Xander and Willow investigating the dead body was the funniest scene of "Beauty and the Beast." These three characters had amazing comedic chemistry together. I'm surprised we didn't get more scenes of them because the way they each interacted with the dead body showed off their personalities. Their adventure in the morgue was a funny break from the seriousness of the Oz/Debbie/Pete story. Willow was the cool-headed investigator, Xander was the sarcastic comic relief, and Cordelia was the every day person who didn't want to be there. Together they had the perfect sitcom mystery on their hands. The DNA not matching Oz/werewolf was a bit confusing. Even if they had pulled random hairs from the body, the sample would've clarified if it was human hair or animal fur. The fact that it was inconclusive didn't coincide to the reality of the situation. The non-reveal felt more like a plot device meant to cause doubt. Were you surprised Angel came back as a feral animal? His demeanor wasn't surprising considering that he was sucked into a hell dimension. A torture like that would've changed anyone, let alone surviving that trauma at all. He was lucky to come back with all of his body parts. In addition to Oz, Angel was being teased as the next possible creature who caused the attack. And he had all the makings of being the killer. His reaction to Buffy, the blood on his body, and his lack of humanity were the perfect red-herrings. On the other hand, there's no way he would've been revealed as the killer so soon coming back. We were meant to root for him and be excited that Angel returned. This killer introduction would've clouded any happiness to have him back. From the moment Buffy was reunited with Angel, there was an immediate tenderness between them. Buffy loved him, and she felt lost when she had to kill him on Buffy the Vampire Slayer Season 2 Episode 22. With her ex-boyfriend returned, he would be able to fill the hole that was in her heart. We can't fault her for keeping it a secret that he came back; she wasn't sure what to do or how to react with him back. And the added layer of the torture he went through in the hell dimension brought back any sympathy lost during his Angelus tirade. He suffered hundreds of years of torture for the crimes he committed. While it doesn't forgive everything he did, like murdering Jenny Calendar, it did help to start connecting with his character again. This feral creature wasn't the same monster who plotted to destroy the world. He was a broken vampire with a soul. There was a long road of redemption he would need to do before he went back to normal. Buffy: Let’s just pretend for a second that Angel somehow found his way back to Sunnydale. What would he be like? Buffy: I remember. So, he would have been down there for hundreds of years? Permalink: So, he would have been down there for hundreds of years? Pete's reveal of being the demonic killer came from left field. With the exception of Mr. Platt's death, there was no connection to him being the murderer. The reveal simply happened and we were meant to go with it. A lot of exposition was included in one scene to answer all the questions that weren't shared beforehand. Like, how did he maul the student and Mr. Platt? What caused the demonic transformation? Why did he do the killings? The glowing green liquid was the be-all-end-all answer for this Dr. Jekyll and Mr. Hyde curse. Debbie's situation was heartbreaking to watch. She clearly loved Pete, but he was treating her horribly during this demonic state. Though, regardless of green potion or not, he was hurting her and emotionally abusing her too. His half-hearted apology to her afterwards meant nothing. Pete was a real monster in both of his forms. He deserved any punishment that was heading his way for the pain he caused Debbie and the people around him. When it came to the Scoobies helping Debbie out, Buffy was being incredibly harsh to the victim. Sure, she kept Pete's attacks a secret, but she was also one of the victims of his abuse and she loved him. Debbie needed support and assistance for getting out from under his thumb. The way Buffy chastised Debbie only pushed her and made her feel guilty for being stuck in a bad situation. Buffy's personality helped her with being a good leader and fighter. However, her short fuse didn't help with being sympathetic to the plight of the people who made bad decisions. A different approach probably could've saved Debbie's life. With a bit more compassion and reason, Debbie could've been brought to a safe house away from the drama. 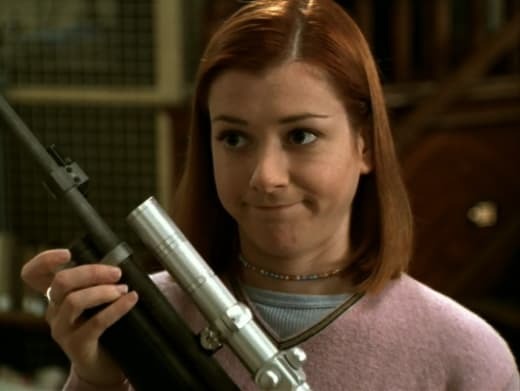 She wouldn't have caused Buffy to shoot Giles with a tranquilizer gun, she wouldn't have ran back to Pete, and Pete wouldn't have been able to kill her. Buffy wasn't to blame for Debbie's death; Debbie was responsible for her own decisions and actions. However, a different course of action could've potentially changed everything. I couldn't help but cringe when the sundown special effect happened. For an episode that aired in the '90s, the changing of the day to night looked too early CGI. Buffy the Vampire Slayer Season 3 Episode 4 showed its age in a big way here. Would Pete have turned into a werewolf by fighting werewolf Oz? The two were rolling around together and Oz did scratch him a couple of times. 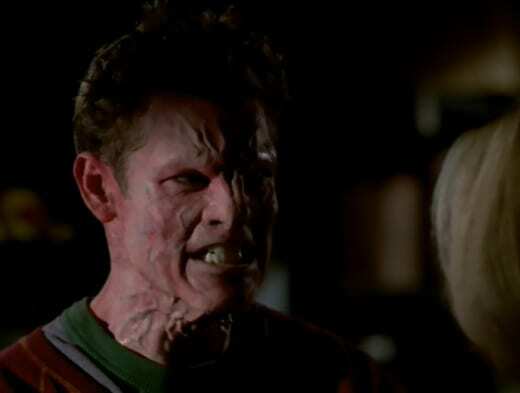 If Pete had survived, a demonic werewolf would be a terrible creature to have around Sunnydale. A cross between species was something that never really happened on Buffy the Vampire Slayer, with exception to the Big Bad Adam of Buffy the Vampire Slayer Season 4. Once Angel came in to save the day and kill Pete, that moment cemented Buffy's future relationship reunion with Angel. And the end of her high school romance with Scott. She couldn't go back to that when her heart was still with Angel. The embrace between the two characters was filled with raw emotion and sadness. Killing Pete was a powerful scene since it showed that even in his feral state, Angel knew deep down he cared about Buffy and wanted to save her. He would do anything to protect her. Her staying at night to watch over him was the first step in them getting back to normal. On the other hand, the Buffy and Angel relationship was never truly normal. We're talking about a relationship between a vampire slayer and a vampire with a soul who came back from a hell dimension; that was already complicated enough as is. The problem with "Beauty and the Beasts" was that the main plot felt like an after-thought to all of the drama happening around it. We were supposed to care about Scott's friends and this creature attack, but the extent paled in comparison to the torment happening with Angel. Even the resolution of how Pete turned into this demonic creature, and why he was killing people, was explained in a throwaway line between the Scoobies. No special attention was paid for this Monster of the Week and it felt like a filler week to build up for a bigger episode. Buffy the Vampire Slayer Season 3 Episode 4 didn't have a strong enough story to captivate, and it finds its way off the rewatch list a lot of the time. What did you think of "Beauty and the Beasts"? Did you want the guidance counselor to survive? Would you have told the others about Angel being back? Want to join us in rewatching Buffy the Vampire Slayer? We'll be posting new rewatch posts on Tuesdays and Thursdays. Come back here and share your thoughts about the episode in the comments.